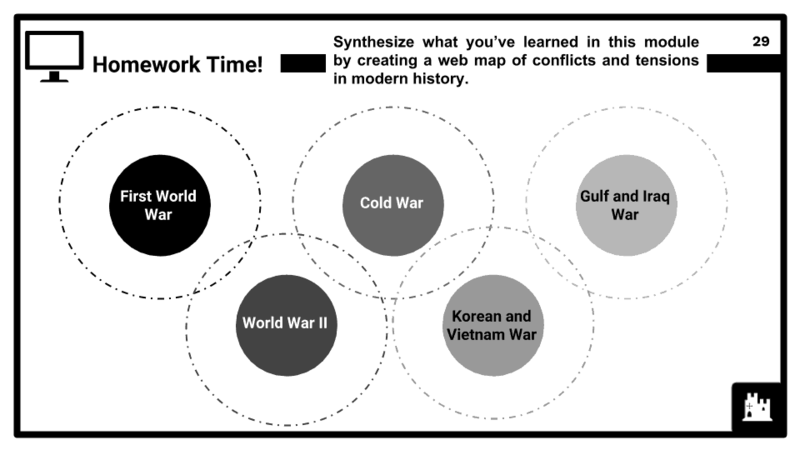 This Wider World Depth Study module covers option BE of the AQA 9-1 GCSE History topic "Conflict and tension in the Gulf and Afghanistan, 1990–2009". In this module, students will gain a greater understanding of the complex and diverse interests of different groups, races, nations and rogue states in relation to the conflicts and tensions in the Gulf and Afghanistan from the late 70s through to the late 90s and early 2000s. The module seeks to show how and why conflict occurred and why it proved difficult to resolve the tensions which arose. This study also considers the role of key individuals and groups in shaping change, as well as how they were affected by and influenced international relations. 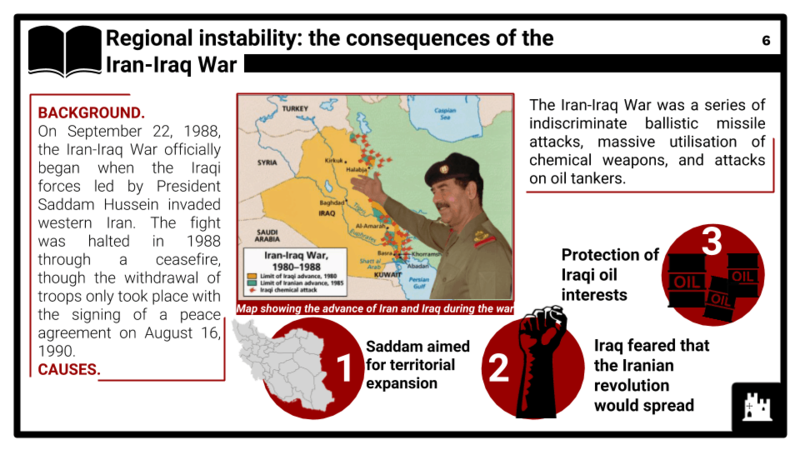 Regional instability: the consequences of the Iran-Iraq war; western and Russian interests in and attitudes towards Iran and Iraq, including the threat to oil supplies; the contribution of the Israeli-Palestinian conflict to tension in the Gulf and to motives for global terrorism. The Gulf War,1990: reasons for the Iraqi invasion of Kuwait; the reactions and roles of Bush and Thatcher; the UN campaign against Saddam Hussein; consequences of the war; US influence in the region; Arab reactions. 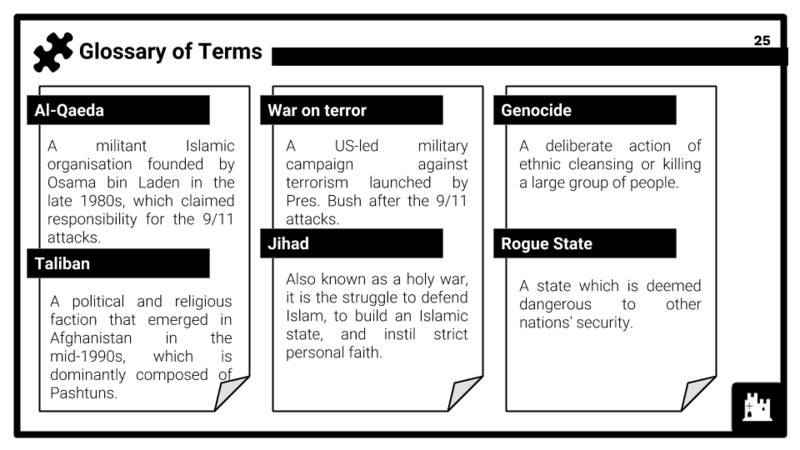 Al-Qaeda: aims of Al-Qaeda and the role of Osama bin Laden; 11 September attacks. Afghanistan: its reputation as a rogue state; the Taliban regime; western and Muslim attitudes to its policies; the problems faced by ethnic groups; the resurgence of the Taliban. 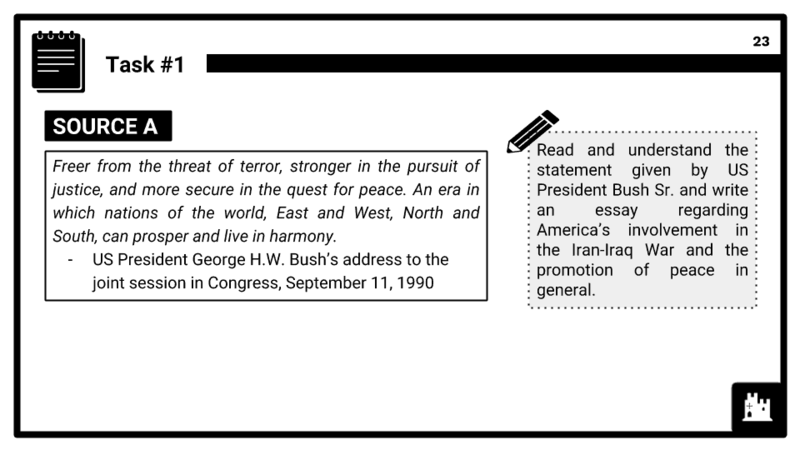 Bush’s war against terror: Bush’s aims; Blair’s support for intervention – the 2001 US/UK operation; the overthrow of the Taliban and collapse of its regime; UN peace conference; problems faced by Karzai’s government. Saddam Hussein’s regime: treatment of Kurds and Shia Muslims; the debate about Iraq’s links to Al-Qaeda and its reputation as a rogue state; religious divisions in Iraq; international attitudes towards Saddam Hussein; the role of the UN. The invasion of Iraq 2003: International Atomic Energy Agency (IAEA) inspectors and the issue of Weapons of Mass Destruction (WMD); the military campaign; western interests, including oil; opposition to the invasion within Iraq and internationally; the downfall of Saddam Hussein. The impact of war on the Iraqi people and across the world; the Insurgency; elections and transfer of powers to National Assembly; global anti-US and anti-UK terrorism; 2007 US troop surge; stability of Iraq by the end of Bush’s Presidency.